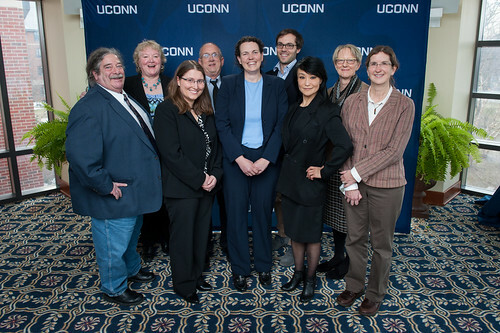 A partial group photo of the GMO Working Group at College’s 2018 Awards and Honors Event. From left to right: Gerry Berkowitz, Bonnie Burr, Jennifer Cushman, Joe Bonelli, Stacey Stearns, John Bovay, Cindy Tian, Diane Hirsch and Joan Allen (who has since passed away). Members not pictured include Candace Bartholomew, Maryann Fusco, Yi Li and Vickie Wallace. Photo credit: Defining Studios. According to a recent Pew Research survey, the largest difference in science-related views between the American public and scientists concerns the safety of food produced from, or that used, genetically modified organisms (GMOs). While scientists say GMOs are safe, the public is skeptical, expressing concerns about the impacts their use may have on human and animal health and the environment. Members of a new unit in the College of Agriculture, Health and Natural Resources hope to be a resource to help bridge this divide by providing the public with accurate information on GMOs. A dozen CAHNR faculty and staff have teamed up to create the GMO Working Group. The unit is undertaking a multifaceted outreach campaign to educate the public on the science of GMOs, offering background on the diverse application of GMOs with research-based consideration of the risks and benefits. 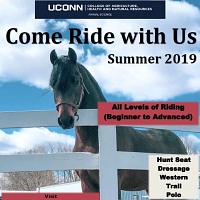 The members have developed an explanatory website for the public and plan further informational initiatives, including videos, panel discussions and a curriculum for 4-H and high school students. 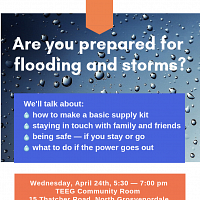 Stacey Stearns, program specialist for UConn Extension, serves as the group’s coordinator. She helped organize the volunteer team, which includes representatives from UConn Extension, UConn 4-H and the agricultural and resource economics, animal science and plant science and landscape architecture departments, all experts who speak to various GMO issues and deliver factual messaging. The working group first established a website to be an easily accessible resource for people interested in learning more about GMOs. Topics related to GMO science and its use in various research fields and industries are explained in brief articles that include discussion of the genetic engineering technologies used to create GMOs, how GMOs are regulated, GMO labeling and common health and safety concerns. All articles are intended for a general audience. Stearns adopted the format of the website from Purdue University’s College of Agriculture. While members of the GMO Working Group believe the website can facilitate greater public understanding, they recognize further outreach and programming is essential, particularly to communicate with youth in 4-H programs and high school. Younger adults are more likely than their elders to consider GM foods a health risk. “One big issue we want to address is conflation,” says Professor Gerry Berkowitz from the Department of Plant Science and Landscape Architecture. Berkowitz’s role in the group is to address horticulture matters and public perception of GMOs. 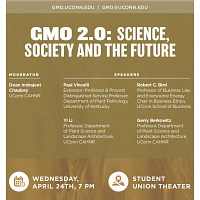 The working group is arranging a panel presentation on the UConn campus in April 2019 to speak to the UConn community, farmers and the general public about GMOs. Farmers and growers are often asked questions about GMOs and their farming practices by customers, neighbors and local officials. A separate training will also be held for farmers. The working group wants to provide resources that farmers and growers can use to share with their audiences. The panel aims to focus GMO discussion on agriculture and less on technologies to shift the conversation to values shared with consumers. 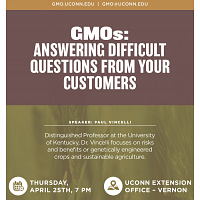 Extension and Provost’s Distinguished Service Professor Paul Vincelli from the University of Kentucky and Cooperative Extension Specialist Peggy LeMaux of UC Berkley will be speakers at the event. This entry was posted in Animals, Environment, Extension, Faculty, Food, Health, Plants, Research, Stories.